Does anyone have any suggestions on the recommended sync interval with the Bigfix.me Dashboard? I am having an issue with syncing content from Bigfix.me to my custom site in the Bigfix Console. If I force a manual sync after a few minutes the content appears in my custom site but if I am to click into another domain and come back later, say after ten minutes the content disappears unless I force another manual sync. 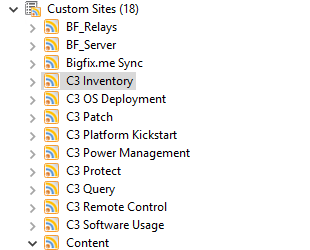 You must make sure you are doing a 1-1 mapping from BigFix.Me Sites to local CustomSites. If you try to sync multiple BigFix.Me Sites to One Customsite it will overwrite the content continually. Interesting. I don’t think I’m doing that right either currently. I think I started with 1-1 and switched to not 1-1 at one point. Either way, BigFixMe syncing needs some work. So am I understanding correctly that if I’m subscribed to five sites in Bigfix.me, I need to have five custom sites for them? This is definitely true for ISV sites (C3, RES, and Carbon Black) but may not be true for non-ISV sites (other sites community members make). This is because ISV sites do a hard sync (updates to the site update in your console) whereas normal non-isv sites just dump the content into the site and don’t propogate changes. I followed your advice and made separate sites and I’m happy to report that all the content has synced correctly without any further issue. Thanks for your insight, I would have never consider the content was overwriting itself.